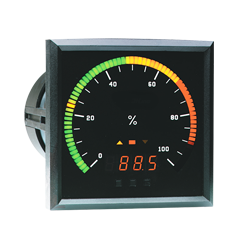 The BTW71P replaces all 41/2-inch standard switchboard circular meters and is a direct replacement for the GE/Yokogawa AB/DB40 and Westinghouse/Weschler K231/241 meters. This simplifies retrofit into existing systems without panel modifications. The instrument is suitable for local or remote, primary or redundant system indication. The bargraph’s color bar uses tri-color LEDs (red, amber, and green) to enhance visual resolution and readability. Standard models can be programmed to display up to five color zones. The color zones on models with the optional set point/relay module are determined by the set point placement: green for normal operation, amber for warning indications (LO or HI), and red for the ALARM indication. The optional four-digit display reads to 10 percent over- and under-range. The colors of the digital display and annunciators do not change and should be specified at time of order (red, amber, or green).